Note: My site is currently undergoing a facelift. It is not quite finished and I apologize for any broken links or other problems that might appear in the interim. This fall I was contacted by Polyform to see if I would agree to be the featured artist on the cover of their 2013 Sculpey catalog. Of course I would! I asked what they wanted for the cover and they replied “cane slices.” At that point I had just returned from Europe and didn’t have any canes sitting around so I had to make one. I explained that I don’t use canes the way most people do; I slice them up and combine different sections of the slices to make a nearly infinite number of unique kaleidoscopic designs. They agreed to that approach and suggested a color combination. The cane I made looked like this. I made it rather quickly and there was quite a bit of distortion, but that didn’t matter with the technique I was using. I sliced the cane into very thin slices and started cutting and combining pieces of slices. These are some of the first designs I made. I didn’t want to just send the raw cane slices to be photographed so I applied them to a backing of scrap clay, trimmed the edges and put them in the oven. By the time I was done I had quite a few designs; each of them unique, like multicolored snowflakes. As the pieces came out of the oven I realized that they wouldn’t photograph well unless I sanded them. Typically my pieces are close to 1/2 inch thick and domed on both sides; I actually enjoy sanding them. Each of these disks was only about 3/16 inch thick , absolutely flat and nearly 2 inches in diameter. If you have tried sanding very thin, flat pieces, you know it doesn’t take long before your hand is cramping, your finger tips are bleeding and your nails are sanded down to the quick. I decided I needed some way other than my hands to grip the disks. The solution turned out to be quite simple. I had my helpful plastics guy make me a disk holder by gluing a 1/8 inch thick piece of plastic with a 2 inch square opening on top of a 1/2 inch piece of solid plastic with the same outside dimensions. I could place the disk in the opening, flip the block over on a piece of sandpaper and and slide it back and forth to sand the disk. Because the disk was thicker than the 1/8 inch-thick frame, the top of the disk was quickly sanded into a flat, even, smooth surface. 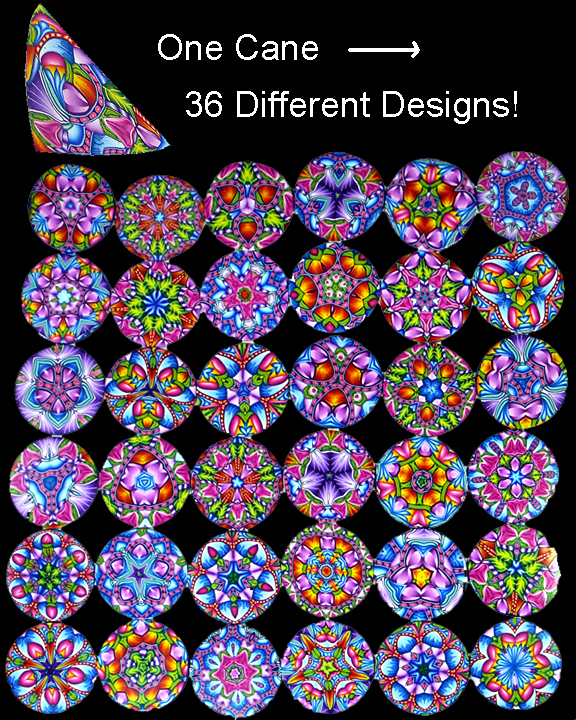 36 kaleidoscope designs from a single cane. The display above is now a piece of wall art for my studio. I call it 36 Permutations. 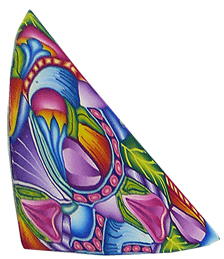 This entry was posted in Caning, Classes/Workshops, Color, Kaleidoscopes, Premo Clay, Teaching, Technique, Uncategorized and tagged Carol Simmons, Color, Color Mixing, Kaleidoscope Canes, polymer clay, Polymer Clay Classes, Polymer Clay Colorado, Polymer Clay Teachers, Polymer Clay Techniques, Polymer Clay Workshops. Bookmark the permalink. There’s a product to add to your arsenal of goodies! Wish I had thought of something like this last summer when I was actually paying to get my nails done. Ruined a couple while sanding. No matter how hard I tried, I couldn’t avoid sanding them down. Forgot to mention, I adore the colors. It’s amazing how beautiful orange can be–even though that’s probably my least favorite color–when it’s part of a gorgeous design with other colors that I do love. I love this colourway Carol! Congratulations on being asked by Polyform to grace the cover of their catalogue! And I agree with Priscilla, you have made another very useful product that I’m sure will sell well. Especially if you debut them at one of your workshops. Absolutely beautiful. I love the colorway and am amazed at how many different combinations you have. If you ever come to the south to teach I’d love to take your class. Thank you, Linda. 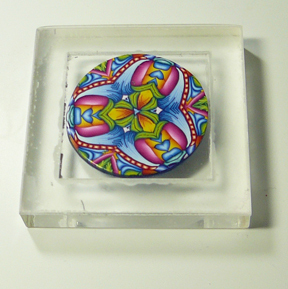 I’ll be teaching Hidden Jewels Mokume Gane in Mississippi in March. I cant wait to get back to my slices And Start a new Cane. Another Great Gadget , if you start to sell them with your other class supplies Lmk. Cant Wait to see the Polyform Cover. I love the colors. It is one of your best colorways yet. Wow!!! So beautiful pieces, Carol! Fantastic! 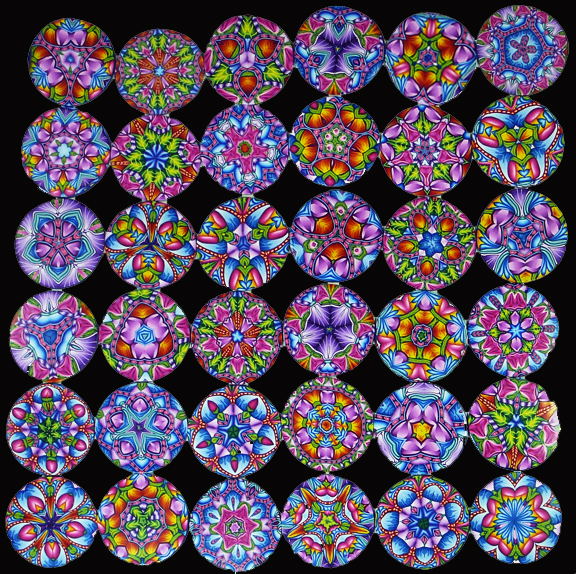 Would love to attend your kaleidoscope workshop. I don’t guess you are ever near the Charleston, SC area? Thank you, Kathy. I did one in Georgia last year. That’s the closest I’ve been. Carol, it’s truly amazing all of the different colors that appear in the pieces from one cane! Marvelous! I regret that I will not be able to come to your April workshop in Racine. The timing doesn’t work well for my work schedule. Hopefully I can catch another one along the way. Congrats on the Polyform gig! Thanks, Eli. I hope you can make it another time! Amazing as always Carol! And congrats on the catalog, you definitely deserve it! These are amazing, Your work is to be admired, I would like to buy something when you get ready to sell, so I can add it to my collection of polymer! I am looking forward to the cover, how exciting! Thank you for the compliment Marcia! Carol, you and your plastics guy are brilliant. Any chance you’ll have a few of these to bring to Synergy 3?? And big congrats on being chosen for Polyform’s cover. Makes perfect sense to me! Thanks Barb. The holder only works with flat items and the opening has to be about the size of the object to be sanded, so it is best to make your own. I would love to be able to make the 36 permutations at our class! This absolutely fascinating! There are so many ways to look at the original piece. It blows my mind!